As an approver you can click on a user's expenses to approve or reject their expense claim. Once an expense is submitted, the approver will get a notification in the Approval section at the top of the page. Any submitted expenses will reside in the Awaiting Approval area. This is where an approver can check the expense information by clicking on the expense. What can you do in the Approval area? 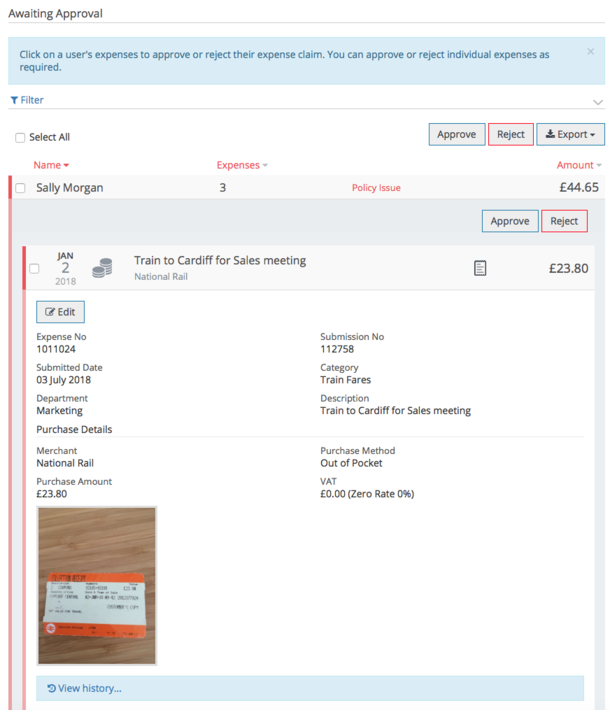 Use filter fields to filter down the expenses. See if there are any policy issues. View the history of the expense. Edit the expense. Please note: This feature may not be turned on for you depending on account settings. Approvers can then decide whether they want to approve or reject expenses. If the approver decides to reject some expenses they can select them and click Reject. You will have to add a reason for the rejection. You can see any expenses who have approved. And any expenses you have rejected. Once an expense has been rejected, it will go back to the end-user's Draft expense area. The end-user will also receive an email letting them know their expenses have been rejected.